The line driver modules have been designed to connect SPI devices and serial shift registers (DINs/DOUTs) to a MIDIbox over long distances. This is for a Line Driver Transmitter PCB ONLY in a standalone/MIDIbox format. The line driver modules have been designed to connect SPI devices and serial shift registers (DINs/DOUTs) to a MIDIbox over long distances. 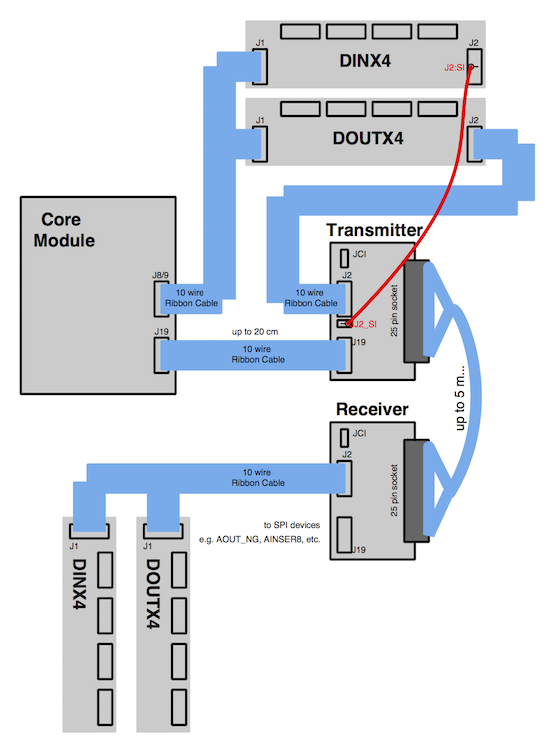 For this purpose two MC3487 are used as transmitter, and two MC3486 as receiver ICs to transfer the serial signals with bidirectional voltages according to ANSI TIA/EIA-422-B (also known as RS-422). 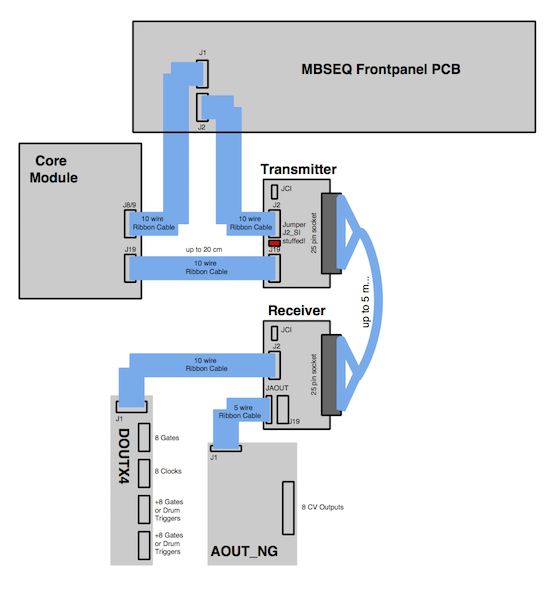 With the given hardware connections up to 5m are possible at 1 MBit/s. Even longer cables could work, but haven't been tested at my side. They might require special twisted pair cables at the right impedance (100 Ohm) - however, the given solution works properly with cheap 25pin male-to-male "parallel cables" as known from the PC world which are also used to connect printers (before the USB era). 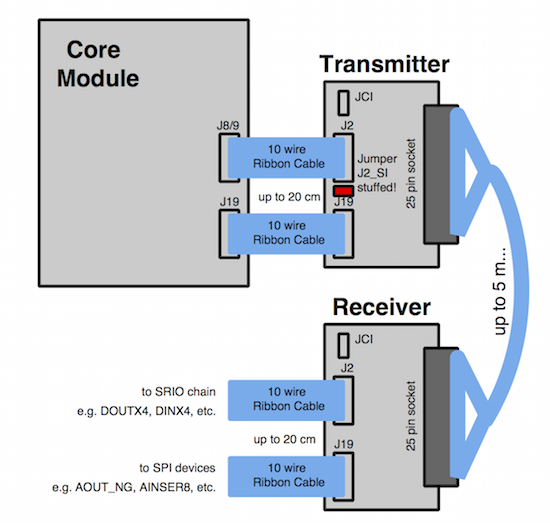 The first SPI port (J2) is usually connected to the end of the SRIO chain (DIN/DOUT modules) or directly to J8/9 of the core module at the MIDIbox side, and allows to connect additional DIN/DOUT modules at the receiver side. The second SPI port (J19) is usually connected to J19 of the core module, and to SPI devices at the receiver side. 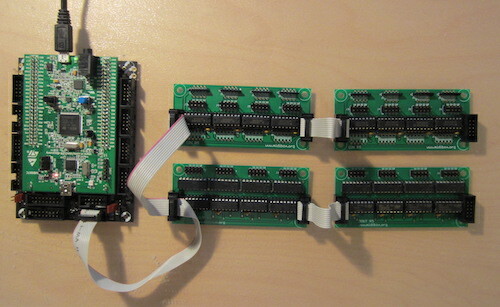 Note that both SPI ports can handle two devices: a separate DIN and DOUT chain can be connected to J2, and two SPI devices can be connected to J19, because two chip select lines (RC1 and RC2) are available.